Heartface Bunnykins loves to love, and shares her love with everyone who cuddles her. She also really loves chocolate (can you tell?) and Easter is her favourite time of the year. Heartface Bunnykins has an oversized, shaggy and slightly messy tail. This makes sitting down a little tricky, but she’d rather be in the arms of someone anyway so it isn’t really problem. She’s just a bit different to other bunnies she knows. Heartface Bunnykins has heart buttons for eyes, a fluffy heart for a nose, and a great big heart in her chest that is so enormous it has to sit on the outside. I know she doesn’t look much like a real Bunny, but I made her up on the go as I went and my heart was in the right place when I made her. And that’s what counts right? 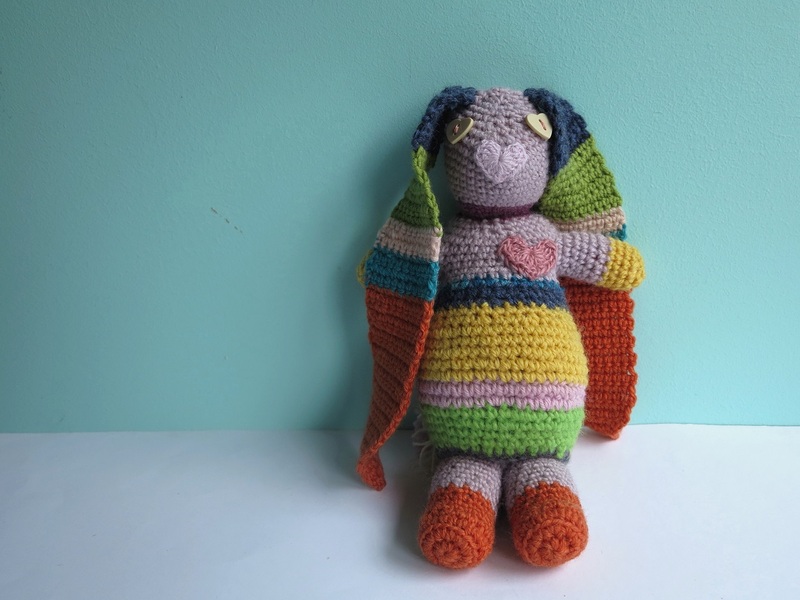 She is going to find a home with a little kiddie thanks to the Mirabel Bun-anza. There are a lot of kids that have either lost a parent or are no longer cared for by their parents due to substance abuse. The Mirabel Foundation look out for these kids and Pip from Meet me at Mikes run’s a Softie drive for them. You may remember Rufus Rad Rabbit that I made? I didn’t think I’d have time to make a bunny for Easter as well, but thanks to a long weekend and a need to sit and craft for a while, I did. I made Heartface Bunnykins. 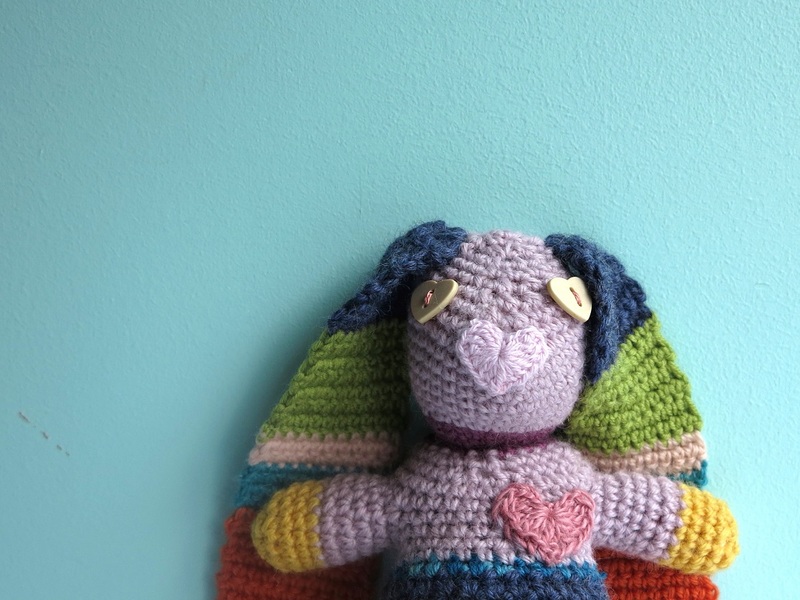 If you have some spare time this week maybe you’d like to make a Bunny of some kind too? You don’t have to crochet them, they can be knitted or sewn. All the details are here but you’ll have to be quick as it closes 15th March. May you have a heart so big it’s bursts outta ya! 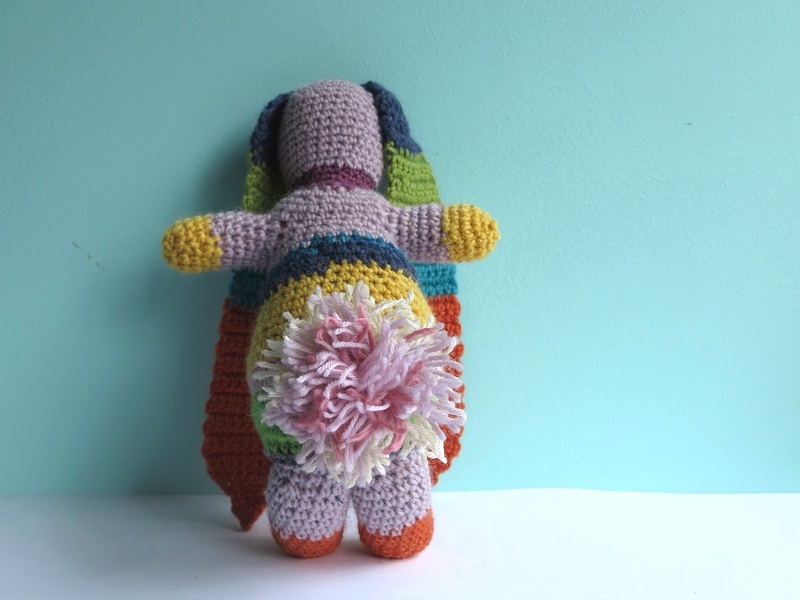 This entry was posted in craft, crochet, inspiration, Photography and tagged crochet, crochet toy, softies for mirabel. Bookmark the permalink. Oh he’s so adorable! (He makes my little softie made for the same cause look a bit tatty in comparison.) You are so clever.